We recently got into a brief discussion online about what it means to be “in control.” After 10 years of Aikido practice, the one thing we have learned is that you can’t control others. Control through force is an illusion, because it is weak and temporary. Real control is the lack of the need to control because the compliance is offered freely. In Aikido, Sensei Gleason often reminds us that we can get out of their way when opponents fall, but we can’t make them fall. Ever tried shoving a tree? A sand dune? or water in a swimming pool? That is the feeling you get when you try to shove someone who knows how to absorb and redirect that energy. The end result is usually that the person shoving does the falling, and the other person just steps out of the way. The feeling of falling is exactly what you experience when part of a well-executed Aikido “throw.” The attacker falls because they lose their balance and are tripped up rather than thrown down. This is an interesting but often misunderstood distinction when trying to learn the essense of or the “secret” to Aikido techniques. Those who study the martial arts know it is next to possible to learn by reading books or watching videos. They are merely mechanisms to help with visualizing the basic forms or to supplement the description of the movements.They fall short as good teaching tools because they can only offer a snapshot of movements in time or a point of view from a single perspective. Still, it would be helpful to have an effective way of showing various techniques and concepts without having to have it demonstrated live. The most innovative approach we have come across to date is a training program called Aikido3D. 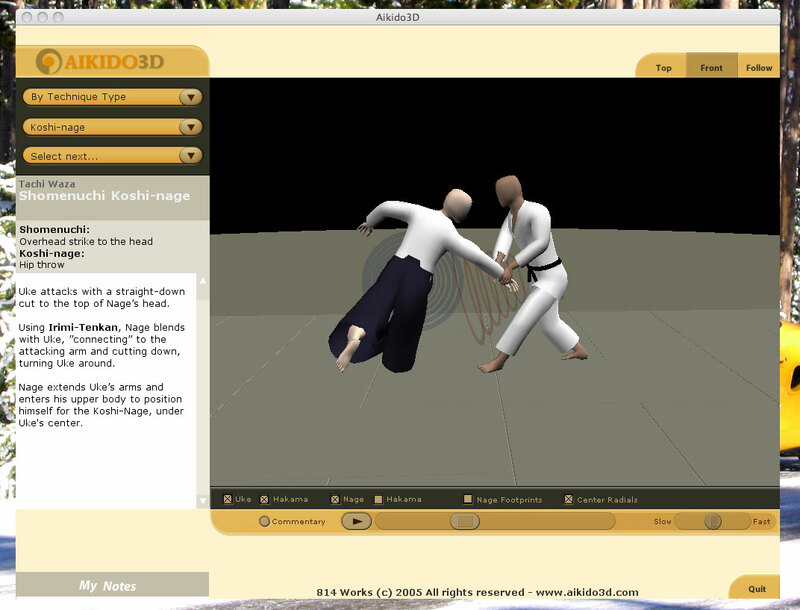 Aikido3D is a new, computer-based instructional aid which is very different from all other teaching tools currently on the market. A few years ago, we looked at a DVD called Digital Experiments in Aikido (DEiA). Aikido3D is similar in some respects to that effort, but it has vastly extended the interactive nature by enabling the viewer to manipulate the camera angle in real time. This capability is tremendously helpful as an exploration and learning mechanism. The sequence above is just three (top, front, angled) of an almost infinite number of possible views of the start of the koshi-nage technique. The controls can show/hide the hakama, the participants, and/or their footprints. While not exactly like the center-of-gravity analysis from the DEiA, Aikido3D can also show the “one-point” radiating from the center of both participants. This is helpful in illustrating the forward direction of the two participants relative to everything in their surroundings. The on-screen controls are intuitive and easy to use. Sometimes, if the camera’s zoom factor is set too high, one can get “lost” in the scene. Clicking on the “center it” button in the middle will always bring things back into view. The sequence below show the koshi-nage technique just before the actual throw. The action can be stopped at any point and analyzed. We grabbed a few different angles to show the power of the Aikido3D approach. The ability to study a technique in such detail has never been available before to anyone but live-in students of a dojo. 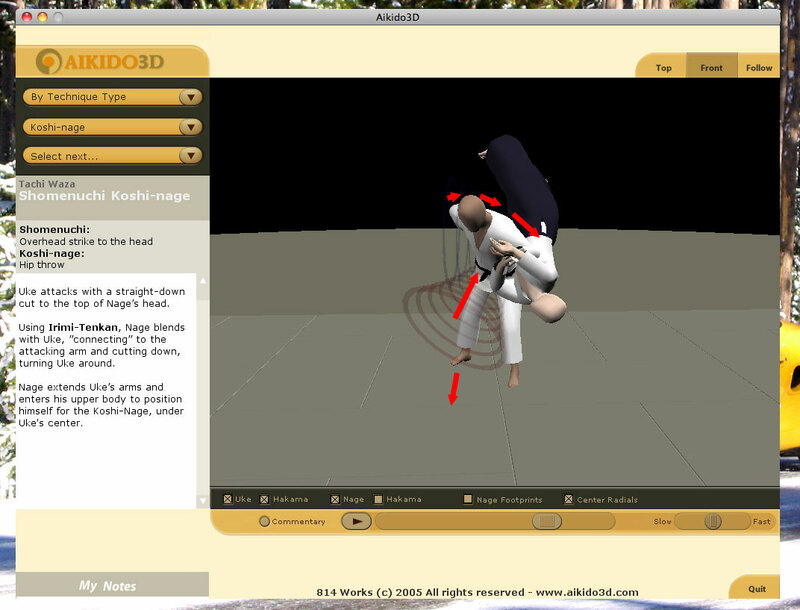 Of course, there is still quite a gap between Aikido3D and live instructions. Is the weight resting on the right or the left foot of the nage during the throw? Is the direction of the force of the arm above extending out and upward or going down toward the ground? etc… These points have traditionally been left for the students to “discover” for themselves during their training. The study of hand-to-hand martial arts is different today as it once was. Most students do not study the martial arts as a vocation and often are not able to make these discoveries on their own. Using the Koshi-nage as an example, it would be great to be able to see a force-vector overlay showing the direction of the ki-extensions at the various points on the nage’s body. We feel the information would add to the understanding of the mechanics of the various techniques. With that said, we are excited about Aikido3D and see tremendous potential in the approach. We hope they will continue to add to the program. The only effective way at present to acquire an understanding of Aikido or any martial art is to learn from a sensei and train with a more experienced partner. This is because what truely makes martial arts effective is often obscured by what is happening on the surface. Where is the point of balance? How is the extension being projected? What does it feel like during the moment of contact? These points are difficult to understand without actually feeling them first-hand. Future computer-based tools may one day give skilled practioners the mechanism and means to describe, record, illustrate exactly what is happening behind the scenes. When that day comes, the “secrets” of Aikido may finally be easier to transmit to others. Those interested in getting a glimpse of that future should take a look at Aikido3D today. 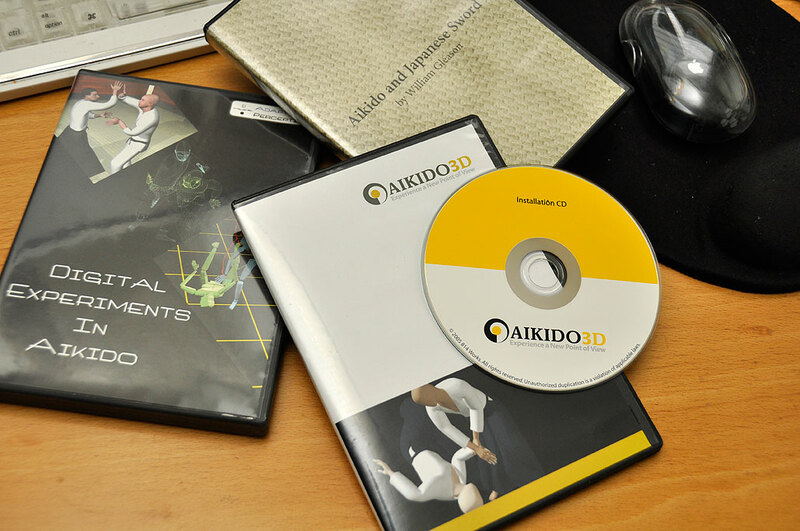 NOTE: The Aikido3D disc is platform specific (Mac or Windows), so be sure to order the the right version. We don’t know if a version is in the works, but it would be awesome to have it on the iPad.